Katie Derham presents a lively mix of music, conversation and arts news. Live music comes from Les Arts Florrisants directed by William Christie, plus baritone Benjamin Appl. Katie Derham presents a lively mix of music, conversation and arts news. 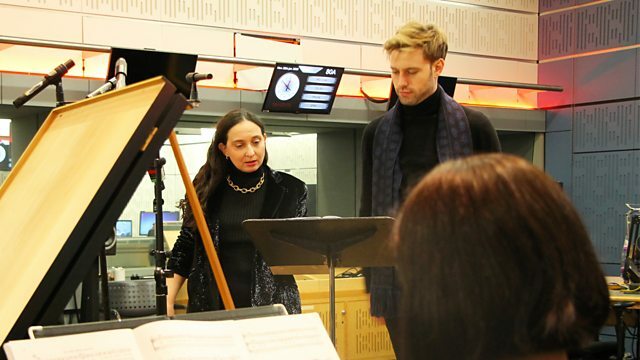 Her guests today include the baritone Benjamin Appl performing the role of Aeneas in a performance of Purcell's Dido and Aeneas with the LPO and Sir Roger Norrington on Wednesday. We also hear from Roberto Alagna and Aleksandra Kurzak ahead of Richard Eyre's production of Bizet's Carmen at The Met, being broadcast both from 6.30pm on BBC Radio 3's Opera on 3 and Live in HD this Saturday. Plus live music from early music ensemble Les Arts Florrisants and their director William Christie. Orchestra: Orchestre national de France. Conductor: Seiji Ozawa. Performer: Benjamin Appl. Performer: Masumi Yamamoto. Performer: Renaud Capuçon. Orchestra: Scottish Chamber Orchestra. Conductor: Louis Langrée. Mozart: Violin Concertos 1 & 3, Sinfonia Concertante. Singer: Roberto Alagna. Orchestra: New York Metropolitan Opera Orchestra. Conductor: Omer Meir Wellber. Singer: Aleksandra Kurzak. Singer: Roberto Alagna. Orchestra: Sinfonia Varsovia. Conductor: Riccardo Frizza. J. Haydn: Symphonies nos. 103 & 104: Norrington. Performer: Luca Pianca. Performer: Christophe Sturzenegger. Singer: Marie‐Claude Chappuis. Performer: Marie‐Claude Chappuis. Performer: Masumi Yamamoto. Performer: Marie‐Claude Chappuis. Performer: Benjamin Appl. Music Arranger: Michail Tsygutkin. Ensemble: Die 12 Cellisten der Berliner Philharmoniker. James Ehnes, Eduard Laurel - Dvorak, Janacek, Smetana.